Chella Skin Care offers specialized solutions to fight the signs of aging with advanced clinical science. Chella's newest launch is their Brow Full-Fillment collection and Saks Fifth Avenue in NYC is now carrying Chella's Brow Color Kits, Brow Tool Kit, Anti- Fatigue Eye Mask Kit, Brow Color Pencils in four shades, and Lace Highlighter Pencil. Chella is providing complimentary brow makeovers at Saks Fifth Avenue in NYC every Friday from now until the end of April. Complimentary makeovers can be booked between the hours of 11AM - 7PM. To make an appointment, please call 212-940-2307. Please note that this offer is first come, first serve, so appointments are sure to book out fast! Zuri did a fabulous job on shaping my eyebrows this past Friday! 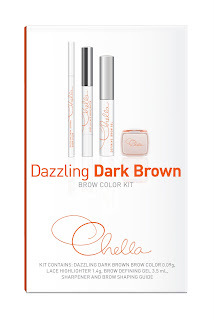 I highly recommend booking your Chella complimentary brow makeover at the Saks Neulash Neuveaubrow counter!